Anyone who’s tuned into their local NPR affiliate on a long drive recognizes the divergent rhythms that different radio shows offer, the “music” in their compositional structures. 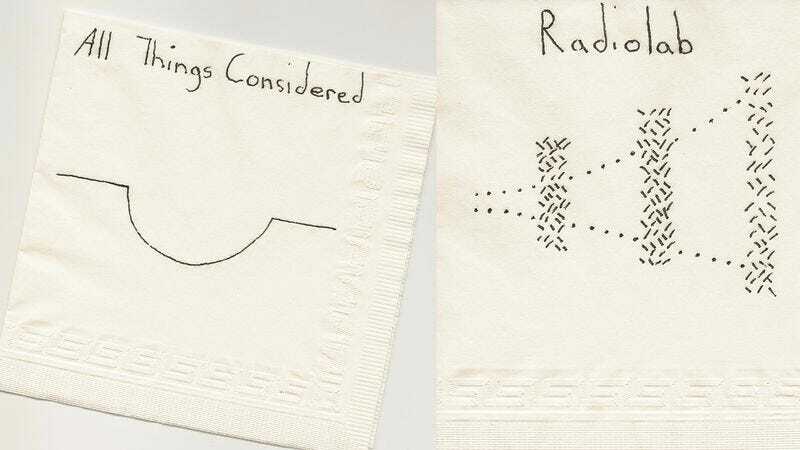 And those structures can be sketched, as Rhode Island Public Radio reporter Bradley Campbell shows in this series of cocktail napkin illustrations. National Public Radio's All Things Considered, for instance, follows an inverted omega pattern: An opening scene that starts with a character (usually) in action, followed by a gully where the main reporting goes, and a final return to that opening sequence to bookend the piece. WNYC's Radiolab, on the other hand, is constructed more like a megaphone, with its first, smaller segments building to an epiphany or crescendo. Of course, none of these sketches are gospel when it comes to the structure of a particular episode, but as an exercise in divining what makes great radio–and storytelling–work, they’re pretty nifty. Check out the full blog post and podcast over at HowSound.